The South Fork of the American, in addition to being California’s most heavily rafted river, is also one of its most heavily dam-controlled. The main whitewater section is upstream of massive Folsom Lake and Dam. Upstream of that are like 49 other dams. Ok, not 49, but a lot–6, in fact. The water in the South Fork is fairly consistent. New water regulations also mean that recreational use gets priority in determining water flows so rafting outfitters, private boaters, and kayakers know they can rely on the South Fork all season long–typically releases of approximately 1300 CFS throughout the main rafting season: early spring to late fall all week, and on weekends in the winter. Winter rafting and kayaking on the South Fork are do-able but be aware that flows can skyrocket to 10-20 thousand CFS during storms, and you might find yourself boating with stray picnic tables, porta-potties and travel trailors. Caution is a must unless you don’t find the prospect of surfing Troublemaker with an entire pine tree intimidating–in which case you might want to rethink your safety strategy. Standard winter flows (and guaranteed weekend releases) are less intimidating but the water remains fast and cold. Bring your wet and dry suits! 700 – 1200 CFS = Low flows. Rocky, but fun and technical, especially in an IK or a kayak. 1200 – 2000 CFS = Normal summer flows. Great for first timers and a lot of the rocks are covered. 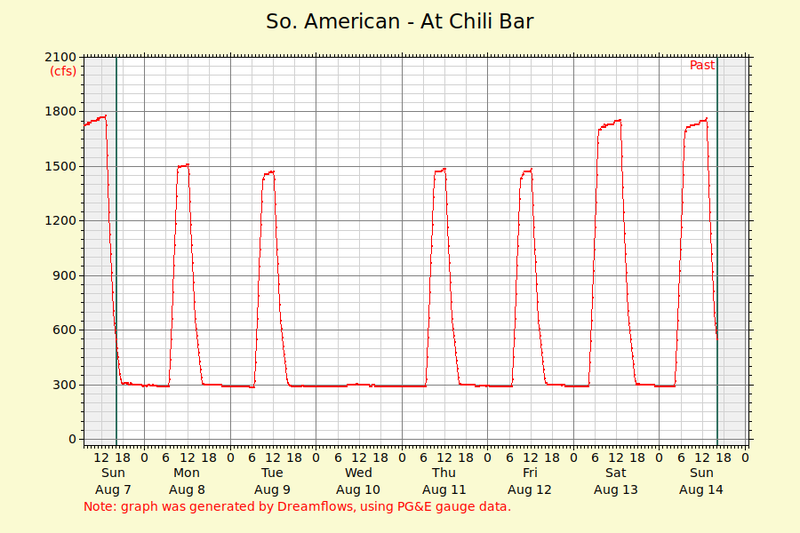 These are the normal summer flows that are released from the Chili Bar Dam. 2000 – 4500 CFS = Medium flows. Great for experienced kayakers and aggressive first timers. Plenty of Class III and fun big wave whitewater. Between 2000 and 3000 is the absolute best level for surfing and play boating at First Threat (on the Chili Bar stretch). 4500 – 8000 CFS = High flows. Challenging Class III & IV whitewater, exciting for experienced rafters and kayakers. Big waves, big holes, and swift moving water. The Lower Gorge gets much more pushy at high flows and is extremely continuous. Above 8000 CFS = Extreme high flows. Fast moving water, with powerful waves and long rapids. Experience is highly recommended. Trips at these levels are best for very aggressive people who are not afraid of falling into a very fast river with long rapids. The local Lotus/ Coloma – South Fork American boating community uses Boof.com all the time to update about flows, finding paddling partners, and discussing local water issues. It’s a California site, but definitely centered around the American River.